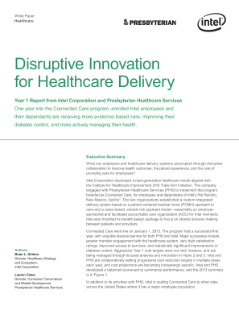 What can employers and healthcare delivery systems accomplish through disruptive collaboration to improve health outcomes, the patient experience, and the cost of providing care for employees? Intel Corporation developed a next-generation healthcare model aligned with the Institute for Healthcare Improvement (IHI) Triple Aim Initiative. The company engaged with ...Presbyterian Healthcare Services (PHS) to implement the program, branded as Connected Care, for employees and dependents of Intel's Rio Rancho, New Mexico, facility. The two organizations established a custom integrated delivery system based on a patient-centered medical home (PCMH) approach to care and a value-based, shared-risk payment model—essentially an employer-sponsored and facilitated accountable care organization (ACO) for Intel members. Intel also modified its benefit design package to focus on shared decision making between patients and providers. Connected Care went live on January 1, 2013. The program had a successful first year, with valuable lessons learned for both PHS and Intel. Major successes include greater member engagement with the healthcare system, very high satisfaction ratings, improved access to services, and statistically significant improvements in diabetes control. Aggressive Year 1 cost targets were not met, however, and are being managed through focused analysis and innovation in Years 2 and 3. Intel and PHS are collaboratively setting progressive cost reduction targets in multiple areas each year, and cost projections are becoming increasingly specific. Intel and PHS developed a balanced scorecard to summarize performance. In addition to its activities with PHS, Intel is scaling Connected Care to other sites across the United States where it has a major employee population. Eric Dishman discusses megatrends driving the healthcare system and Intel's computing technologies and solutions to support care. Intel-powered devices strengthen information security and enhance doctor/patient interaction. An ambulance crew tells how computers have improved their ability to care for people in an emergency.